several publications (1959-1966) and data from Ruhr-University. 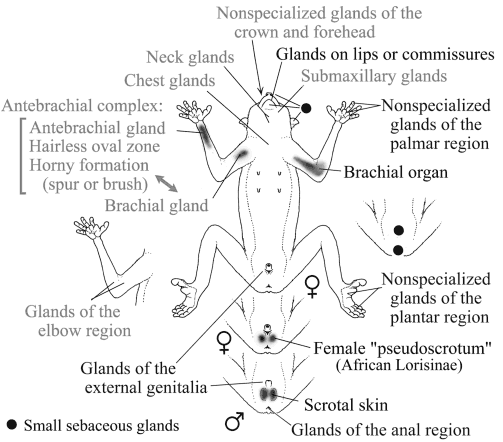 Occurrence of scent glands and related structures in prosimians, including the Malagasy lemurs. Names of glands occurring in lorisidae are written in black, glands only found in Malagasy lemurs in grey. In the Asian lorises, an optically inconspicuous, but large brachial organ and other glands, particularly in the genital region, occur. The African lorises have got conspicuous glandular areas in the genital region instead (scrotal skin, pseudoscrotum in female pottos). Based on Schilling (1979), Rasmussen and Nekaris (1998) and other sources. Number and location of mammae: Ansell (1965) recommends routine recording of the number of mammae for taxonomic purposes in lower primates and other groups. The number may be constant over a whole mammal order or vary considerably. 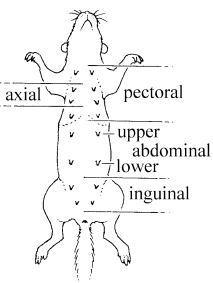 Jenkins (1987), quoting several authors, mentions 2-8 mammae in Loris: one pectoral pair to two pectoral and two abdominal pairs. At Ruhr-University, all lactating Loris fermales had two well visible (functional) pairs of pectoral mammae. Only parous females can usually be used for determination; some mammae may be non-functional and inconspicuous. Proposition for a notation as a mammary formula (Ansell 1965): 1-0-2=6 means 1 pair of pectoral mammae, no abdominal ones, two inguinal pairs. Ansell, W. F. H., 1965: Standardisation of field data on mammals. Zoologica Africana 1 (1): 97-113. Jenkins, P. D., 1987: Catalogue of Primates in the British Museum (Natural history) Part IV: Suborder Strepsirrhini. British Museum (Natural History), London. Rasmussen, D. T.; Nekaris, K. A., 1998: Evolutionary history of lorisiform primates. Folia Primatol. 69 (Suppl. 1): 250-285. Schilling, A., 1979: Olfactory communication in prosimians. Pp. 461-542 in: "The Study of Prosimian Behavior", Doyle, G. A. and Martin, R. D. (eds. ), Academic Press, New York. Alterman, L., 1995: Toxins and toothcombs: potential allospecific chemical defense in Nycticebus and Perodicticus. Pp. 413-424 in: Creatures of the Dark, Alterman, L.; Doyle, G.; Izard, M. K. (eds. ), Plenum Press, New York. Alterman, L.; Hale, M. E., 1991: Comparison of toxins from brachial gland exudates from Nycticebus coucang and N. pygmaeus. American Journal of Physical Anthropology, Sup. 12: 43. Montagna, W.; Ellis, R. A., 1960: The skin of primates II: the skin of the slender loris (Loris tardigradus). Am. J. Phys. Anthropol. 18: 19-43. Montagna, W.; Yasuda, K.; Ellis, R. A., 1961: The skin of primates III: the skin of the slow loris (Nycticebus coucang). Am. J. Phys. Anthropol. 19: 1-21. Montagna, W.; Ellis, R. A., 1959: The skin of primates I: the skin of the potto (Perodicticus potto). Am. J. Phys. Anthropol. 17: 137-162. Montagna, W.; Yun, J. S., 1962: The skin of primates XIV: further observations of Perodicticus potto. Am. J. Phys. Anthropol. 20: 441-449. Montagna, W.; Machida, H.; Perkins, E. M., 1966: The skin of primates 33: the skin of the angwantibo (Arctocebus calabarensis). Am. J. Phys. Anthropol. 25: 277-290.